HomeMusic VideosNEWS: Shields release “Black Dog”! NEWS: Shields release “Black Dog”! Taken from their upcoming new album “Life In Exhile” our on 20th April via Long Branch Records, Shields have released an official music video for “Black Dog”. The band will play an album release show at London’s Boston Music Room on 21st April. 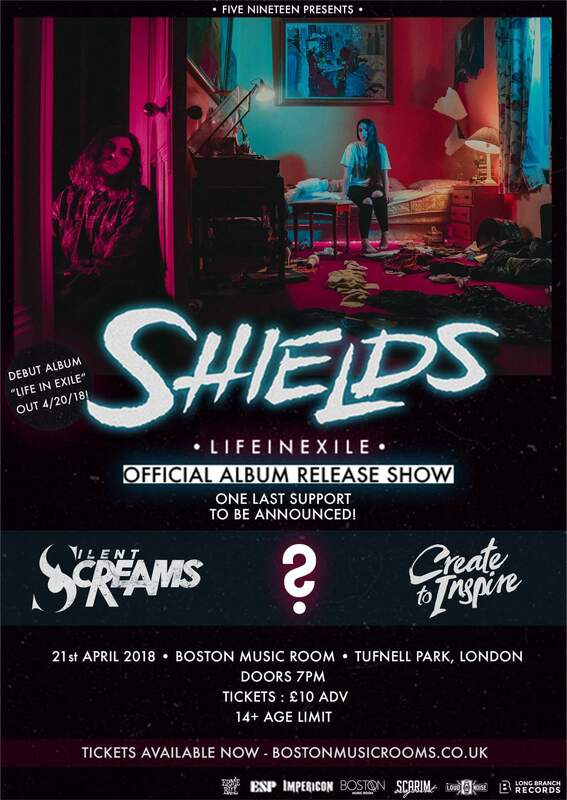 The show will see Shields supported by Create To Inspire, Silent Screams and an as yet unnamed band, rumoured to be Counting Days, who feature former “Count Your Blessings” era Bring Me The Horizon guitarist in their ranks. NEWS: Get Rowdy with “Free Yourself” from Sumo Cyco! NEWS: DVSR announce new album coming 2017! NEWS: Betraying The Martyrs bring “Eternal Machine”! I don’t quite know a) how they released this so quickly after the news their guitarist had committed suicide and b) how they are managing to tour so soon after the event as well. That must’ve been one hell of a turn of events, fair play to them for carrying on ASAP. Aye. For those not in the know, Shields guitarist George Christie sadly took his on life on 31st January. While no official announcement has been made on a replacement, from the photos in the press around the bands return show at London’s Koko in support of Escape The Fate, the band are continuing as a four piece with Sam Kubrick handling all the guitar duties.